Heads up for all of you who want to save time cutting fabrics and a bunch of money, too. 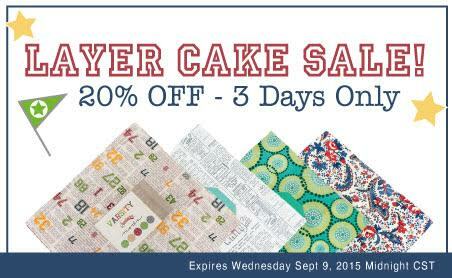 Fat Quarter Shop is offering 20% off layer cakes until this Wednesday. I am hesitating between Bloom and Bliss, Bella Solid Neutrals, and Bella White, or maybe I should get all three! Anyway, I am sure we all have room for some more fabric in our stash... and we deserve a treat as we celebrate all our labor in our quilt studios! If you have a better excuse to buy fabric, on sale or not, leave me a comment!